This Saturday we're going local and can be found at the Maiden Place Community Centre for the Phoenix Spiritual Group's Cake and Clairvoyance event. Patricia will be tarot reading and we'll also be selling our handcrafted gifts and growing range of tarot and divination products. Find out more on their website here! This Sunday we're back at the Bracknell Craft and Gift Fair where we will be selling our handcrafted gifts and growing range of tarot and divination products. Patricia will also be tarot reading so drop by and see us! If you're around the Windsor area this Sunday, drop by to the Old Windsor Psychic & Natural Therapy Fayre at the Old Windsor Memorial Hall where Patricia will be tarot reading and we will be selling our range of tarot related goodies! If you're around the Bracknell area this Sunday, we'll be at the Berkshire Mind, Body and Spirit Festival - selling our range of divination and related items and as a bonus, Patricia will be reading tarot and giving a dowsing talk! Drop by and see us! When you’ve just started to learn tarot it can get frustrating trying to remember all the meanings of the cards – let’s face it, 78 cards are a lot of cards to recall and sometimes particular cards in your favourite deck will keep eluding you. There’s no harm in using books and online resources for memory jogs but when you get to the point where you want to fly solo, you might find a tarot journal useful. A tarot journal is simply a record, in your preferred medium, of your readings, interpretations and any other thoughts or notes on tarot or your tarot learning progress. Active learning, pattern recognition, keeping track of personal progress and letting your mind connect the things you’ve learned so far with new ideas. It’s well known that simply reading, watching, or listening to information is not always enough to let your brain retain it; however writing things down, or noting the information via some other artistic medium, engages your brain in new ways and increases your ability to remember what you’ve learned. Keeping a tarot journal lets you focus on the meaning of a particular card or cards – regularly looking at the cards in a reading and noting them and their meanings in your journal lets you connect with their symbology. With repeated recording of the cards and your thoughts on them, you’ll soon have instant recognition of each card and gain a deeper intuitive connection with your deck as a whole. It can sometimes be difficult to get to grips with the idea of patterns in a tarot spread. 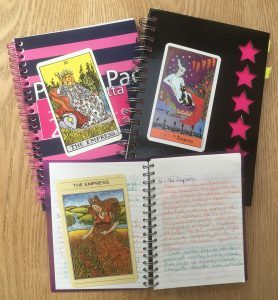 Writing notes in your tarot journal helps you keep better track of the patterns in a reading – like dominant suits, whether major arcana or minor arcana are more prominent, or if there are a lot of court cards. Each of these patterns bring deeper nuance to your reading but can be easy to glance over or ignore if you’re new at tarot reading. Writing down the cards in a journal lets you take extra time to see the patterns and work out what they mean for that reading. And the bonus is once you’ve practiced your tarot pattern recognition like this a few times, seeing and interpreting the patterns will start to become an instinctive part of your tarot reading. Sometimes it’s hard to judge how far you’ve come in a new skill. If you keep having trouble with a particular card, or spread, you might start thinking everything is hopeless and you’ll never get it. Keeping track of where you were when you started will help you see how far you’ve come – you might currently be stuck on only one card, but the notes in your journal will remind you that once you were stuck on all 78 so you’ve got written proof of your success so far! A tarot journal also lets you keep track of your own personal circumstances, how they’ve changed, and how your card drawings reflect those changes. Once you’ve got into the habit of writing down a regular card or full reading, your mind will soon start stretching beyond the traditional interpretations of the cards. The more you note down interpretations for a particular card, the more comfortable you will be accepting the intuitive leaps that appear in your mind when you see the images. Trust those leaps, note them down too. Different days and different spreads and different personal circumstances will change how you relate to any given card, so keeping notes will let you keep track of themes and changes, and might even give you ideas about new possible interpretations. Regular notebooks, binders with dividers, diaries or other journal books are the easiest and most common. If you bullet journal you can have some extra fun by making a tarot specific bullet journal, or if you prefer to go digital, there are a multitude of note/planner apps and other programs you can adapt for your purposes – your preferred word processing program is just as viable as a more complicated planner app. If you prefer creating art to writing, then you could sketch your own images to suit your interpretation of particular cards or create a scrapbook of image associations, you could use an online venue to write or broadcast your journey – create a blog on WordPress or Tumblr, photo journal on Instagram or Pinterest, vlog on Youtube or create a podcast. As with all things tarot, go with what works best for you. Once you’ve chosen your medium, it’s just a matter of adding your content. Pick one, two or three cards and write their interpretations down. You could note down the standard book/website interpretations then follow that up with your own impressions of the images on the cards. It doesn’t matter if your own impressions are wildly different from whatever resource you’ve chosen to use for reference – your own thoughts are just as valid as the accepted interpretations. Also make notes on your current personal circumstances and emotions, or other events around you, in case they become relevant later. You never know what will make sense in hindsight and if some piece of understanding clicks in your head at any point after your reading, feel free to go back and note that down too! Add something to your tarot journal daily, or whenever you can fit it in your weekly routine, and when you’ve got into the habit with the simple stuff, you can expand your notes with analysis of more complicated spreads, focus on patterns, examine other symbology, go off on tangents with comparisons to other divination systems or different deck designs. If a particular tarot exercise – like regular one card readings - becomes too much of a grind, switch things up and try something different. Have some fun by working out what songs or movie characters match what cards, or use a card as the basis for some short fiction or other art! Anything that keeps the tarot and their symbology an active part of your life is fair game! 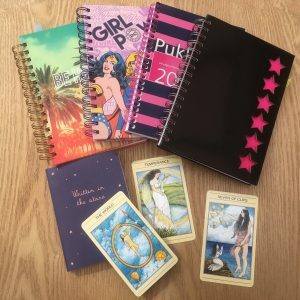 Above all, remember that the tarot journal is there to help you with your tarot journey – there are no rules for how or when to use it, as long as you use it! If you're around the Hampton area and fancy an interesting evening out on Wednesday drop by the riverside Bell Inn for the Hampton Psychic Fayre! Patricia will be tarot reading and giving a short dowsing talk! If you're local to Shinfield this Sunday, come and see us at the Shinfield Village Market! We'll be there selling our range of tarot, runes, dowsing rods, pendulums, tarot bags, divination books and other lovelies, and Patricia will also be tarot reading! This weekend we have a fantastic double bill of events to thrill and amaze you with! We'll be selling our range of handcrafted jewellery & gifts, tarot, tarot bags, runes, pendulums, dowsing rods, divination books (including the just released Let's Try Dowsing!) and much more at both events, and Patricia will be reading tarot in Basingstoke on Sunday. Whichever one you're nearest to, drop by and visit us! We are pleased to announce the publication of the revised and updated edition of Let’s Try Dowsing - now live on Amazon! Whether you are simply curious about the art of dowsing or are looking to make dowsing a part of your deeper spiritual journey, this book will give you the basic foundation skills to get started. You will find tips on how to centre yourself and ask the best questions, how to make and dowse with pendulums, rods and forked twigs, how to make and use dowsing answer boards to give greater context to your enquiries, and when you’re ready to try things out, there’s a selection of dowsing exercises you can use to hone your skills. 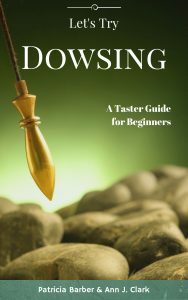 You’ll also find information on the fascinating history of dowsing and how it is used in modern times along with some resources to take your studies further. Let’s Try Dowsing is available in kindle format for £1.99 from Amazon or in paperback format from Tarot4You at various events in Berkshire, Hampshire and surrounding areas!